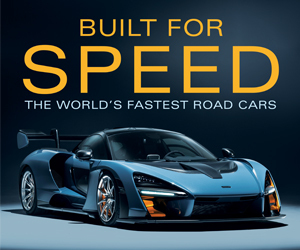 This is an installment in a series of posts looking back on show cars that we feel deserved a little more attention than they got. If you have a suggestion for a Forgotten Concept topic, please shoot us a line or leave a comment below. Details: Since the Isuzu XU-1 was more of a design concept than a technology showcase, there are few technical details to share. The XU-1 borrowed its body-on-frame architecture from the production Trooper SUV, as well as that truck’s 3.2-liter V6, 4-speed automatic transmission, and 4WD hardware. The XU-1 rode a 109-inch wheelbase but was just 176 inches long overall, thanks to its tidy front and rear overhangs. The concept’s most notable design feature is arguably the large pillarless openings created when both the front and rear doors are open. 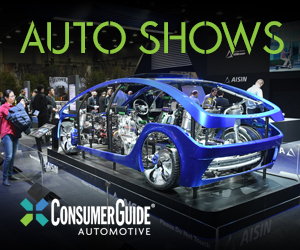 The XU-1 made the rounds of American auto shows after its Tokyo debut, and was reportedly still on tour three years after its introduction. Though not an obvious heir, the 2002-2004 Axiom (left) owes some of its design cues to the XU-1 Concept–most notably the grille treatment and roofline. 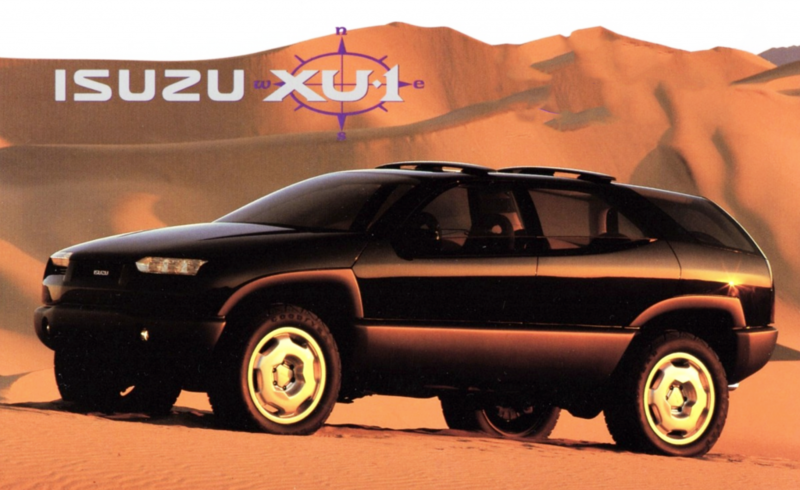 CG Says: Compare to the ruggedly boxy Rodeo and Trooper SUVs Isuzu was selling in 1993, the XU-1 was a breath of crease-free fresh air. 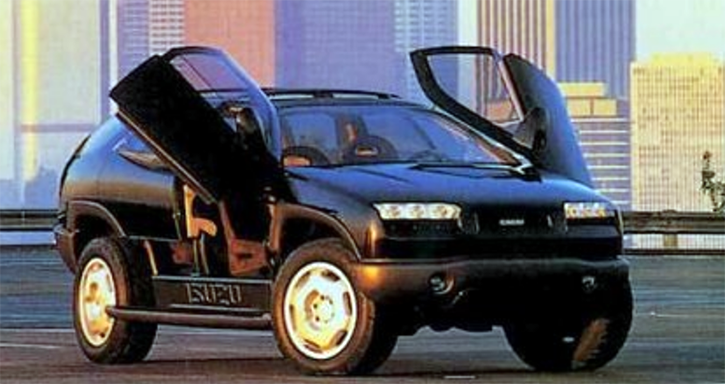 The scissor doors were obviously a bit of show-car whimsy, but the XU-1 was otherwise a reasonably practical peek at what Isuzu vehicles could have looked like a few years later. Though more angular and slab-sided than the XU-1, the new-for-2002 Axiom (above) owed elements of its design to the XU-1. 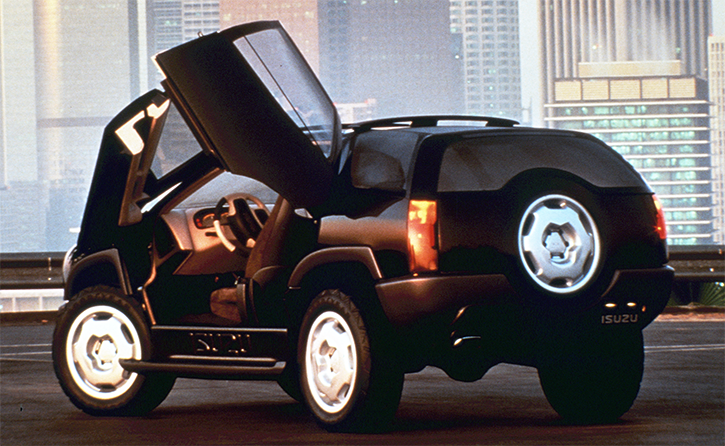 The XU-1 was an elegant departure from the boxy Rodeo (left) and Trooper (right) SUVs Isuzu was selling at the time of the concept vehicle’s introduction. Written by: Tom Appel on February 4, 2019.on March 22, 2019.